Some folks surmised that it was an act of desperation in hopes of arresting the brutal slide in the bank’s shares – and the stock market, in general. 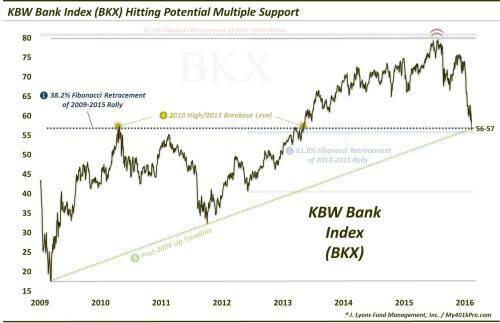 Examining the chart of the KBW Bank Index (BKX), however, we wonder if A) the purchase wasn’t shrewdly timed and B) Mr. Dimon has a technical analyst advising him on his shares purchases. We say that tongue-in-cheek, however, the CEO of one of the largest financial institutions in the world no doubt has an army of analysts advising him, including those of a technical bent. Thus, it is not a surprise that news of his share purchase occurred precisely at a level of multiple potential support on the BKX around 56-57 (if not JPM). These are each significant levels in their own right. The fact that they all converge in the same vicinity increases our confidence in their relevance. Of course, price is the only truth so it remains to be seen whether the BKX does indeed bounce here. However, it doesn’t seem like a coincidence that news of Mr. Dimon’s share purchase would occur just as the BKX was probing this area. More times than not, it pays to follow someone like him into a trade like this. Again, it remains to be seen if a substantial bounce in the BKX will occur here but there is certainly ample evidence to support one (yesterday’s action is a good start too). Should it occur, it should buoy the broader market as well, for the time being. That being said, would such a bounce be sustainable and provide a springboard for the BKX to challenge its former highs? While anything is possible, based on our longer-term analysis of the stock market, don’t bank on it. "in my experience is that when the crunch comes, bank CEOs lie"
"I don't trust Deutsche Bank. I don't trust what they're saying. And there's reason why the banks are being sold all across the world... because people are realizing once again that we don't know what's there [on bank balance sheets]."